Surrounded by water, Sydney is stunning from almost any angle. Often voted among the top cities in the world to live it has a fantastic mix of indoor and outdoor activities with a cosmopolitan vibe. We worked hard to put together a comprehensive collection of our favorite spots and while this isn’t meant to be reflective of everything to do and see in Sydney, nor in any particular order, it’s a fantastic starting point to base your stay around. 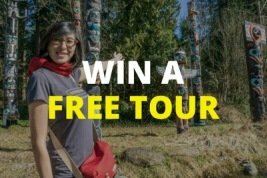 If you truly want to experience this city from the ground roots, we strongly recommend booking a private walking tour in Sydney with us. 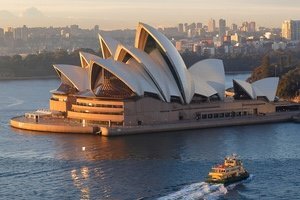 We will be happy to work with you to create the most amazing experience for your time in Sydney and have included our itineraries to give you a better understanding of some of the things we cover. One of Sydney’s famous landmarks, the Harbour Bridge (aka the coathanger) was completed in 1932 and connects the city to the north. For a great view and some bridge history, climb the 200 stairs in the south-east pylon. Feeling a little more adventurous? 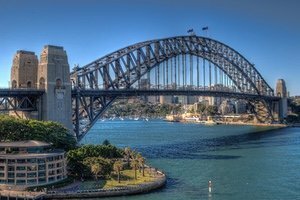 Then you might like to climb to the top of the Sydney Harbour Bridge. 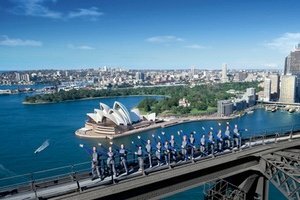 Possibly the most popular attraction in Sydney, the Bridge Climb will satisfy your thrills and provide the most incredible views of Sydney. Check out one of Sydney’s premier symbols, located in the heart of Sydney Harbour. Home to seven arts companies, grab tickets to watch a concert, musical gigs or dance performance, or buy a cocktail and watch the sunset outside this UNESCO World Heritage Site. Abbreviated by locals as “the QVB”, wander the floors of this heritage-listed late 19th-century building filled with stores, restaurants, and galleries. Be sure to check out the Royal Clock on the upper level for its trumpeting procession of English royal history every hour and the Great Australian Clock that displays 33 scenes from Australian history. 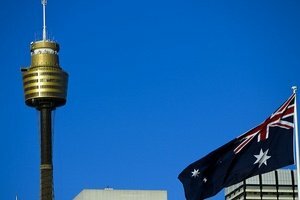 Take a trip to Sydney’s tallest building at 309 meters above the ground. This golden spire rises above the busy shopping mall. Express lifts whisk visitors to the observation deck at the top, or to SKYWALK, a glass-floor viewing platform. Enjoy panoramic views of Sydney and its surrounding suburbs or enjoy a bite to eat at one of the revolving restaurants. Stroll through Australia’s oldest botanical garden, a 74-acre oasis filled with both native and international species. It’s a wonderful place to have a picnic, admire the flora and fauna or just take a break from Sydney city life against the backdrop of the harbour. Walk down the cobblestoned alleys to discover locally-designed fashion, handcrafted jewelry, homewares, art, beauty products and photography in the heart of the historic The Rocks area every weekend. For food lovers, check out the Foodie Market on Fridays. 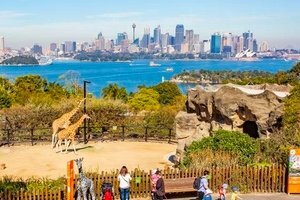 One of the world’s most scenic zoos, where you can see over 4,000 animals against the backdrop of the Sydney Opera House and sparkling harbor. Consider taking a ferry ride to the zoo from Circular Quay. 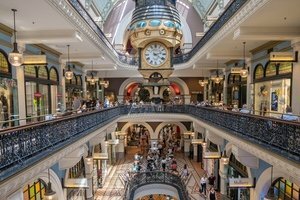 Located beneath the famous Sydney Tower, you can shop to your heart’s content at the dozens of stores inside Westfield Sydney, The Strand, MidCity, and the Myer department store. Outside you’ll find street performers along the promenade. If you’re seeking out some shade and a chance to do some people watching, take a seat at Hyde Park amidst the fountains, flowers, trees and lawns. 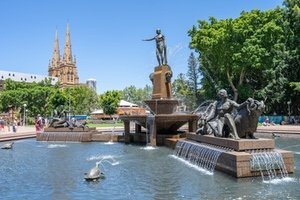 The park’s Archibald Fountain commemorates Australia’s alliance with France during WWI, while the Art Deco Anzac War Memorial honors the war’s victims. 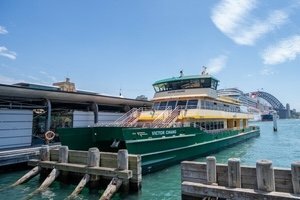 Take a trip from Circular Quay on one of Sydney’s green ferries to Manly. This is the perfect way to see the harbour from the water as you pass by the Opera House, Harbour Bridge, Fort Denison and other highlights. 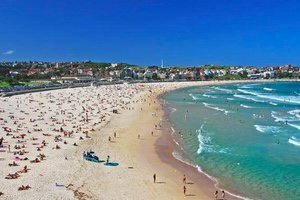 The world-famous Bondi Beach is known for its sweeping kilometre-long stretch of sand, along with the scores of surrounding cafes, bars and shops. Besides swimming, surfing and sunbathing, you can also go for a six-kilometre hike from Bondi to Coogee Beach, or nab a spot for a barbecue at the northern reserve. A modern museum built over and around the remains of Australia’s first Government House, the Museum of Sydney celebrates the people and events that have shaped the character and soul of this city. 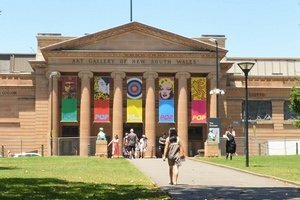 Nestled in the Domain near Hyde Park, the Art Gallery of NSW houses a fine collection of Australian and international art. It’s free to visit the permanent collection of this public gallery, with special exhibitions at an additional charge. 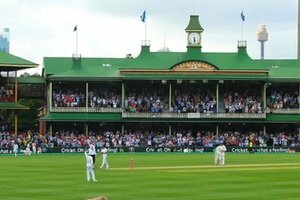 The Sydney Cricket Ground (known as the SCG) is a sports stadium where you can watch two of Australia’s most popular sports – cricket, Australian rules football (AFL), rugby union and rugby league. 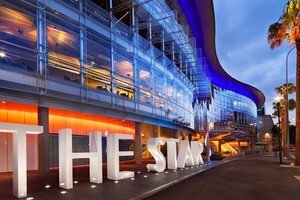 The Star Sydney is Sydney’s leading entertainment precinct and world-class casino. Featuring more than 20 food and wine options, including some of Australia top restaurants. The Star Sydney also includes two luxury 5-star hotel towers, a day spa, designer retail collection, and international nightclub Marquee. 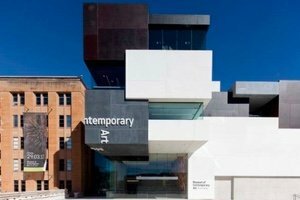 Sydney’s major modern art venue, the Museum of Contemporary Art Australia (MCA) is a perfect place to see contemporary Australian, Aboriginal, and Torres Strait Islander artists, from sculpture to painting, photography, video art, and installations. Turn to the skies for inspiration with a seaplane flight and intimate picnic getaway for two. Leave it all behind as you glide through the air tracing Sydney’s northern beaches. Touch down on your secluded beach, only accessible by seaplane or boat. 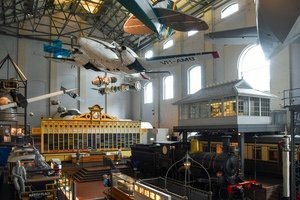 The Museum of Applied Arts and Sciences — known as the Powerhouse to locals because it’s built in an old power station – has a diverse collection of all things science and technology. Here you’ll see over 250 interactive exhibits and over 400,000 objects, including New South Wales’ first ever locomotive. 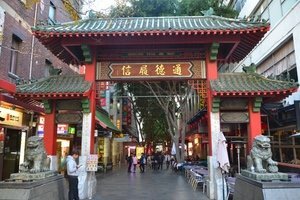 Flanked by lion gates at each end, Sydney’s Chinatown is a popular place to eat and shop. 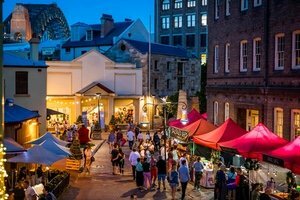 On a Friday night, you can check out the markets that serve everything from dim sum to teppanyaki, while Paddy’s Markets, has hundreds of stalls selling fresh produce, bargain fashions, and souvenirs every Wednesday to Sunday. 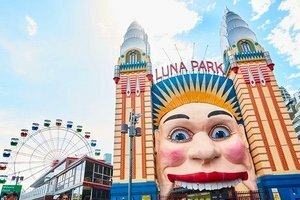 You can’t miss the huge smiling face of the moon as you enter Luna Park, an amusement park with a Ferris wheel and the Tango Train located on the edge of Sydney Harbour. 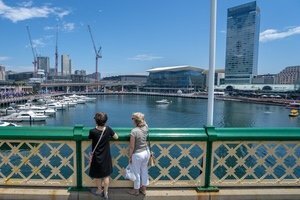 You can either catch a short ferry ride from Circular Quay to Milson’s Point or take a train that goes along the Harbour Bridge to Milson’s Point station. 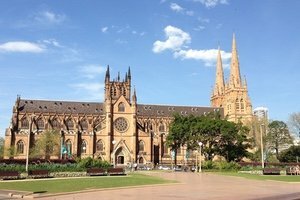 This neo-Gothic church is the oldest place of worship for the Catholic community in Australia. Facing Hyde Park, this church is notable for its twin spires, intricate stained glass windows and devotional objects, with the building’s entrance façade inspired by the Notre Dame in Paris. 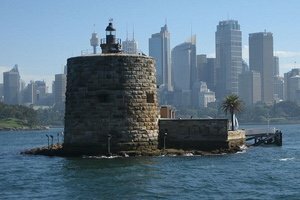 Fort Denison has been at the heart of Sydney Harbour for over 150 years and over that time has had a varied past – it has been used as a fishing spot, defence structure, navigational guide, tide gauge station, weather station, and historic museum. 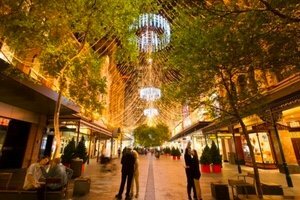 A short walk from the city center, here you’ll find one of Sydney’s largest shopping, dining and entertainment precincts. A lively spot during the evening where you’ll find a bar and restaurant to suit every palate overlooking the water. 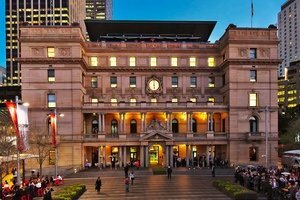 Customs House is a heritage-listed museum space, visitor attraction, commercial building and performance space located in the Circular Quay area. One of the most alluring attractions is a scaled model showing the 10 square kilometres of downtown Sydney below your feet, near the entrance. 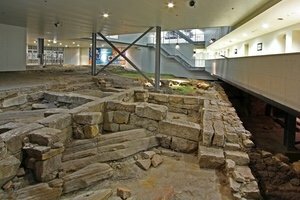 The Big Dig site, between Cumberland and Gloucester Streets in The Rocks, is an area of land containing archaeological remains from the late 18th century, the time of Australia’s first European settlement. Bangarra (meaning “to make fire”) Dance Theatre is Australia’s leading Indigenous performing arts company that blends dances, songs and stories drawn from Aboriginal and Torres Strait Islander culture. This award-winning dance company has supported the professional development of over 100 artists since it was founded in 1989. 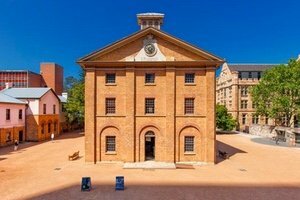 The Hyde Park Barracks Museum will close on 29 January 2019 for a major renewal project that will transform the UNESCO World Heritage-listed site into a world-leading heritage destination. 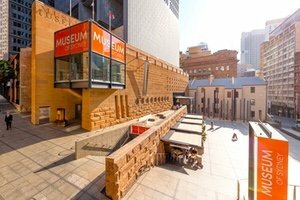 The Museum’s last day of operation will be 28 January 2019. 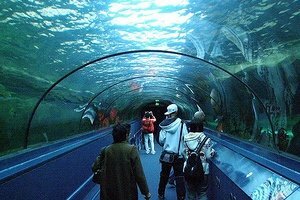 SEA LIFE Sydney Aquarium has the world’s largest collection of Australian aquatic life, including sharks, dugongs, stingrays and more. If you’re feeling adventurous, you can even choose to snorkel with sharks during your visit. 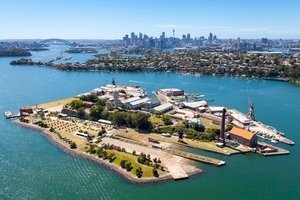 A UNESCO World Heritage site, Cockatoo Island combines colonial convict history with industrial shipbuilding heritage. You also can book ticketed guided tours online, including convict precinct tours and haunted history night tours. Spending time here is memorable and moving, so plan for at least half a day.